Legal paternity rights normally refers to the rights of a biological father to exercise parental rights, such as having child custody and the rights to make legal decisions on behalf od a minor child. Of course, along with legal paternity rights, Thailand law also imposes duties and responsibilities on fathers who have lawful paternity rights. These duties and responsibilities include the duty to financially support a child, to take reasonable care of the child and to be responsible for the consequences of legal decisions made on behalf of the child. The issue of legal paternity is often raised when a child is born out of wedlock. Thailand law provides automatic paternity rights are established by marriage to the biological mother. However, although a biological mother’s legal parental authority is established upon birth of her child, the same is not true for biological fathers. If a biological father is not married to the biological mother, parental rights are not conferred to him. Therefore for an unmarried biological father to obtain parental rights (“paternity rights”) the father must normally carry out a court action or government registration. Alternatively, a marriage to the biological mother after birth of the child may, in some circumstances, may also confer paternity rights to the biological father. Disputes often occur between the mother and father of a child with regard to custody rights. This may occur in a divorce case. However there can also be custody disputes between parents who are not, and may have never been, married to another. In this regard, a man may be the biological father and have established a relationship with his child, but without having met the necessary legal requirements, may lack the legal rights to his child. As a result, the biological father, who has not previously established his lawful paternity rights may be required to file a paternity action in Thai court prior to asserting custody rights. \A common misconception is that a father’s name on a birth certificate establishes paternal rights. This is not correct. Merely being listed as the father on a birth certificate does not confer legal paternity rights. 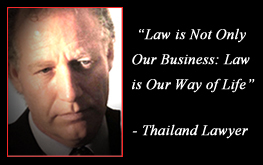 The law for foreign fathers is basically the same as it applies to paternity rights of a Thai father. In order to have rights to one’s child, the father must either be married to the mother or file for paternity rights pursuant to the legal process. However foreign parents may have additional legal issues, other than parental rights and paternity, to contend with. One important issue with regard to foreign parents with Thai spouses is establishing citizenship rights of the child in the foreign spouse’s home country. Establishing citizenship is usually a combination of the foreign law and Thai law: each nation will have its own legal requirements. Normally in Thailand citizenship applications for children are handled by the Embassy of the parent’s nationality. Establishing paternity outside of marriage involves a specific court and registration process in Thailand. For establishing rights of the foreign father, each Embassy will have its own procedures. Evidence required includes the submission of specific legal documents; DNA tests and Thailand court orders are also frequently required.